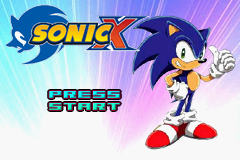 Sonic X: A Super Sonic Hero (or Sonic X : Game Boy Advance Video Volume 1) is a GBA Video Game Pak for Game Boy Advance which contains two episodes of the animated TV series Sonic X. This volume contains episodes 1 and 2 from Season one, Enter the Supersonic Hero!, and Infiltrate! Area 99. This instruction manual requires additional or replacement scans. 8179DB48 C1342378 + BA5AFF9C 3BCDEB74 Enable Code (Must Be On). F7E66278 D85F65EC Run On Game Boy Player. This page was last edited on 17 February 2019, at 21:05.